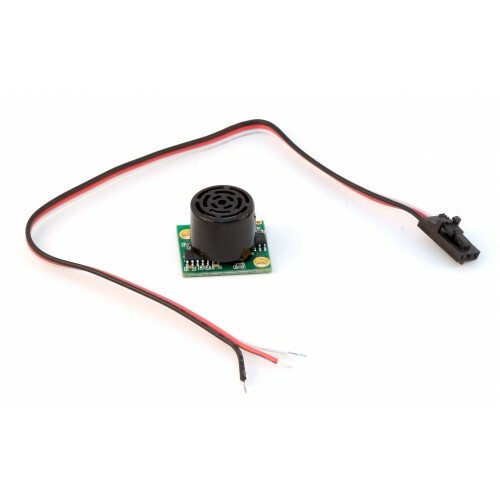 The Sonar Sensor is a compact high performance ultrasonic rangefinder made by MaxBotix that can detect objects at a distance of 6 to 254 inches (6.45 m) with a 1 inch (25.4 mm)resolution. The sensor automatically calibrates itself when powered up. 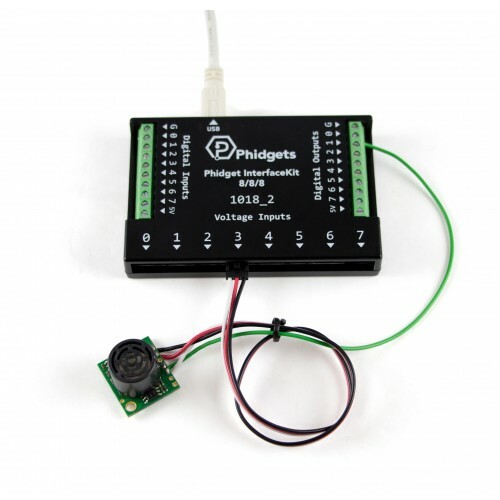 The Phidget cable that ships with the 1128 must be soldered to the sensor board; the EZ-1 sensor can then be connected to an analog port on a PhidgetInterface board and controlled through our powerful API. 3002 – 60cm Phidget Cable that must be soldered to the sensor board. 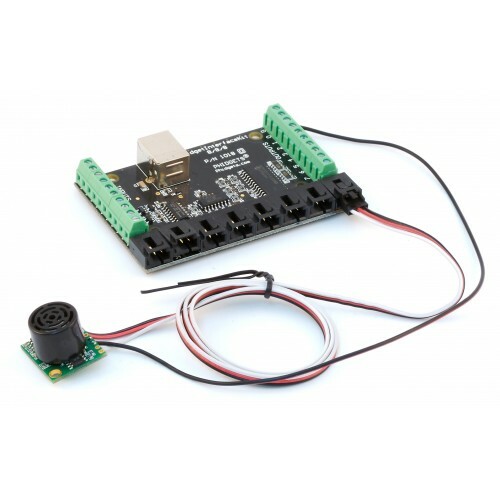 For information on connecting the sonar sensor and using the Phidgets API, read the User Guide. 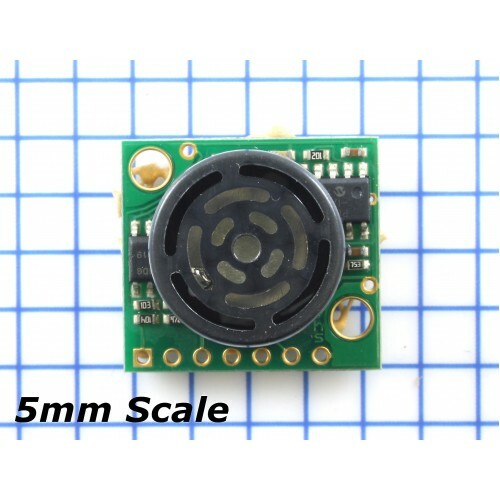 For detailed technical information on the EZ1 sensor, read the Maxbotix datasheet. Any Phidget with a Voltage Ratio Input port and optionally a Digital Output port (for turning sensor on/off), here are some compatible products. We will be using the HUB0000 for this guide. 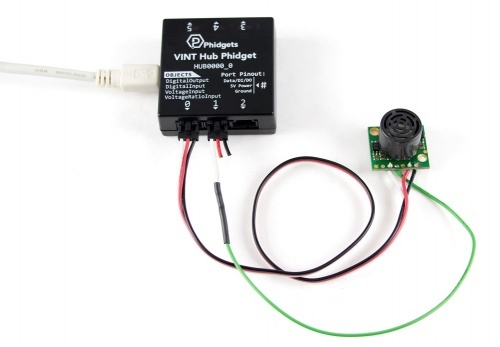 Connect the 1128 to the HUB0000 with the Phidget cable. If you're using the fourth wire, connect it to a digital output port on the HUB0000. Now that you have everything together, let's start using the 1128! 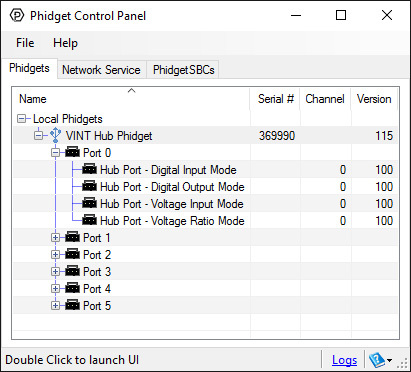 In order to demonstrate the functionality of the 1128, we will connect it to the HUB0000, and then run an example using the Phidget Control Panel on a Windows machine. Linux users can follow the getting started with Linux guide and continue reading here for more information about the 1128. Select the 1128 from the Sensor Type drop-down menu. The example will now convert the voltage into distance (cm) automatically. 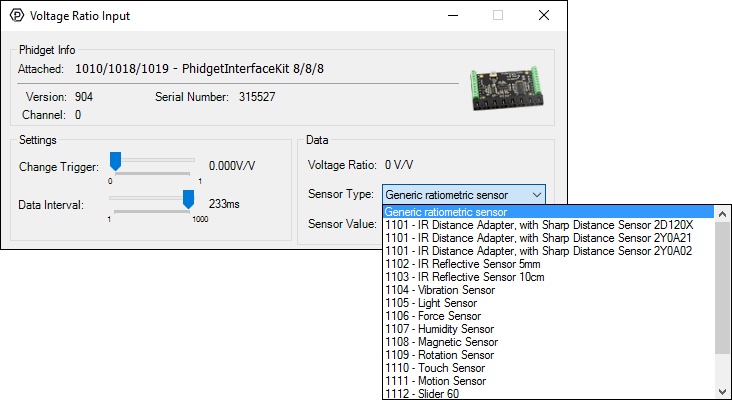 Converting the voltage to distance (cm) is not specific to this example, it is handled by the Phidget libraries, with functions you have access to when you begin developing! Toggle the state of the digital output by pressing the button. This will turn the sensor on/off if you have connected RX to the digital output. 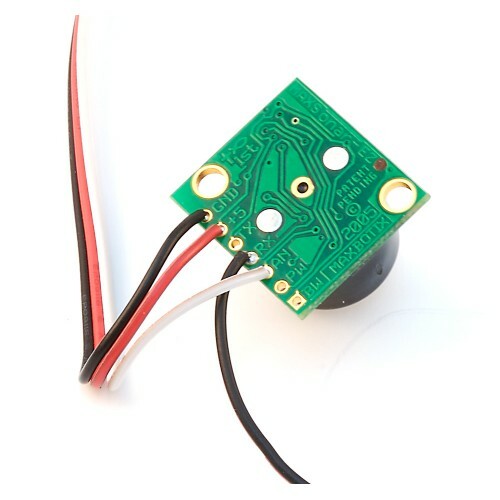 The Sonar Sensor is manufactured by MaxBotix. We have added a Phidget cable and instructions on soldering the cable to the sensor. The 1128 is ratiometric. Ensure you are using the Voltage Ratio object. Each time the LV-MaxSonar®-EZ1™ is powered up, it will calibrate during its first read cycle. 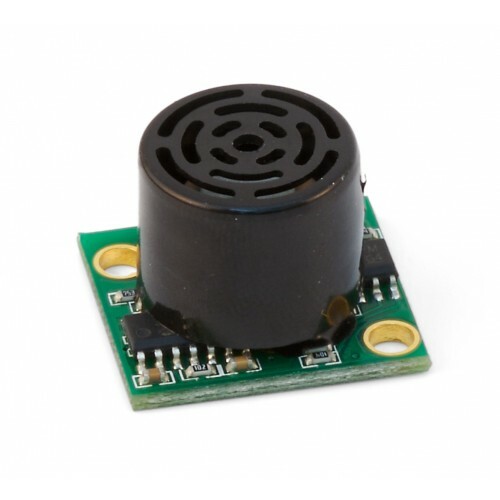 The sensor uses this stored information to range a close object. It is important that objects not be close to the sensor during this calibration cycle. The best sensitivity is obtained when it is clear for fourteen inches, but good results are common when clear for at least seven inches. If an object is too close during the calibration cycle, the sensor may then ignore objects at that distance. 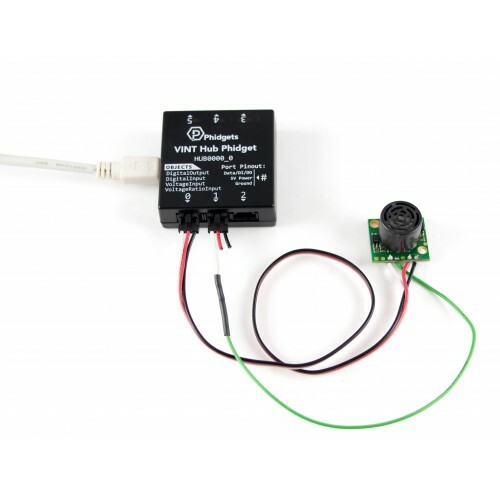 The LV-MaxSonar®-EZ1™ does not use the calibration data to temperature compensate for range, but instead to compensate for the sensor ringdown pattern. If the temperature, humidity, or applied voltage changes during operation, the sensor may require recalibration to reacquire the ringdown pattern. Unless recalibrated, if the temperature increases, the sensor is more likely to have false close readings. If the temperature decreases, the sensor is more likely to have reduced upclose sensitivity. To recalibrate the LV-MaxSonar®-EZ1™, cycle power. For more complete specifications on the MaxSonar-EZ1, please visit MaxBotix. Since the beam width is fairly large and sound tends to reflect more than light, sonar sensors will interfere with one another if more than one is active in a sensor array. To avoid interference we recommend that you poll each sensor individually and only activate the specific sensor you are polling. That way you can activate one sensor, read the distance, and then deactivate it before moving to the next sensor. This will give you clean results. 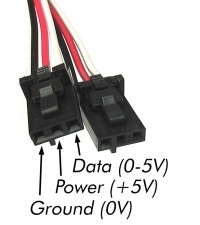 Perhaps the easiest way to achieve this is to take the power line from the sensor and connect it to a digital output of your HUB0000 (or compatible product) instead of the normal analog input power pin. This will allow you to toggle the power to the device and turn it on or off at will.